In a nutshell, the Caetrati was the bearer of a roundshield, the caetra. It was a thick roundshield, very sturdy and small, usable as a weapon in its own right, beyond the usual function of dodge and parry sword and spears points. It was a close-combat infantry, using a short sword, either a gladius or Falcata, and carrying in some cases javelins. It was very common during the 4th-3rd century BC as shown by the Punic wars, up to the time of the Jugurthine wars. < Two western and northern Iberians, reconstruction by Álvarez Peña 2002. The Scuta was probably the most current shield in use among the Iberians, a staple of Iberian and Celtiberian warfare as was the Falcata. The latter was a very famous sword, with elegant curvatures which served a precise function, the shape giving it a much heavier blow in slashing than a straight sword or gladius, while still being able to do thrusting. It was a versatile sword, well-suited to ambush fighting rather than prolongated fight. Compounded by this, the Falcata benefited from the excellent quality of the Iberian steel, and according to Polybius it was so skillfully forged, that there was a compelling story about it: A falcata bearer was able to lay it on his head, and bend both ends so much that it touched his shoulders without breaking it. The Scuta on the other hand, was a small roundshield, with a metal embossing which left a central handle, all in wood and metal-rimmed as well, in iron. There could have been some canvas on the scuta in order to be painted, in order to differentiate the armies, as there were a lot of in-fighting among Iberians, especially given the great disparity in culture, even language between the tribes and nations. The Scuta was rather small, about 40cm in diameter, less than half the size of an Hoplon, and flat. It offered little protection, which further deepens the point about skirmishing and ambush warfare rather than large pitch battles, which would have been the exception and not the norm. Of course our records of ancient Iberian warfare is linked to the presence of the Carthaginians, and later the Romans. 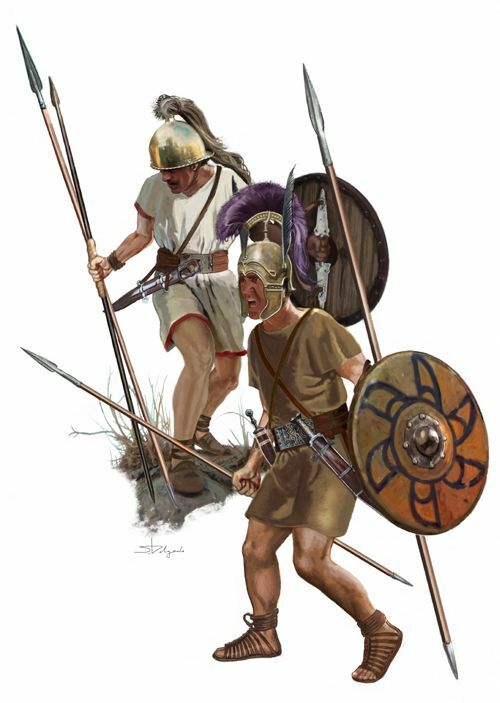 Iberian and Carpetani Warriors, by Sandra Delgado for Desperta Ferro, Antigua y Medieval (https://sandradelgado.com/). Notice the helmets, left a typical Montefortino style Celtic helmet, and right, an Attic-Iberian style helmet, possibly influenced by Greek settlers in the east. The Carpetani were a Celtiberian tribe, right in the center of Iberia. Notice the left one has a Falcata, the right one a short sword, the "Gladius Hispaniensis" later adopted by the Romans and a dagger. Both has a two spears, a throwing one and a classic long spear about 2,50m with a relatively small spearhead (compared to the Gallic ones). Notice however as the left warrior hold a soliferum, an all-metal throwing spear which was a great deal of inspiration for the Roman later pila, in its definitive form. The pole is wrapped in fabric in its middle-section for handling, as the soliferum would have been baked by the Iberian sun in the field. Of course both carries a scuta, covered and rimmed in leather, nailed in the anterior surface. Leather made also a good painting basis. Both warriors shows again, the kind of warfare this equipment meant. Small groups of versatile warriors, throwing spears, then attacking with their spear or sword (spears which could have been left in a prepared retreating position in case of an enemy counter-attack, with cavalry or heavier troops). The Falcata like the Soliferum were designed to give the mortal blow at the first run. It could be speculated that like the Celts, the first charge was meant to be decisive if possible, but in the Iberian case, it was all based on surprise, rather than psychological intimidation the Gauls were fond of. It could be added that this kind of warfare was dictated by both the culture and landscape. The culture was not one of large city states in the Greek fashion, but rather small villages and oppida-like fortresses in a largely mountainous terrain. Most mountain warriors tended to practice the same kind of attacks. The scuta as shown by reenacters could be compared to the small medieval and renaissance buckler. It was a duelling tool almost, make to parry a similarly armed opponent. But whereas the buckler became small and all-metal, the Scuta still could be used to stop arrows and javelins, in a nactive rather than passive way. Indeed, warriors wielding larger shields tend to ued these in a passive way, just hiding behind it and at some distance as some arrow and spearheads still could penetrate the wood layer to some distance. It is better suited for pitched battles, in a more organized fashion where both armies tend to start with skirmishers, slingers and archers to "softening up" the troops. In an archery-dominated warfare like in the East, the Persians used their very large sparabara like a mobile wall, to protected the fellow archers behind. These are not designed for close warfare but a static "arrow-traps". In the case of the scuta, it was purely a parrying shield, light enough to be wielded fast enough to catch impending projectiles. It could be assumed also it was used as a weapon in itself, by pure blunt force. < Caetrati in the IIIth century BC. The Caetrati seems to have been an oddity, proper to Iberia, but in fact there is no proof the Gauls would not have used it as well. There are evidence showing that past the Pyrenees shields were invariably oblong or semi-rectangular, the rare rusted rims that had been found seems to how longshields, not round ones. On the other hand, roundshields became commonplace in the later Imperial era, especially at the time of the so-called "barbarian invasion". Was that for simplification, to be used in shieldwall tactics, or a long lineage going back to the Caetra ? The Caetra was 30 to 60 cm (1ft to 2ft) in diameter, constructed from wood sections attached by two metal bars either in copper, iron or bronze, covered with leather, and sometimes metal-rimmed. They had metal fittings, ornaments on the face and iron boss as a general deflector. In close combat, the shield less good as blocking then as a secondary weapon punching with the boss. Caetras were compact enough to be be hung on a belt or across the back, by a strap, as to not be an hinderance in other tasks. The Cavalry was also often seen using a caetra, as a lighter load for their mounts. La caetra was the typical shield of Iberia. The Caetra was less suitable for combat in formation than in guerrilla warfare. Apparently it dated back from the Bronze Age, located in the Southwest of the Iberian Peninsula. 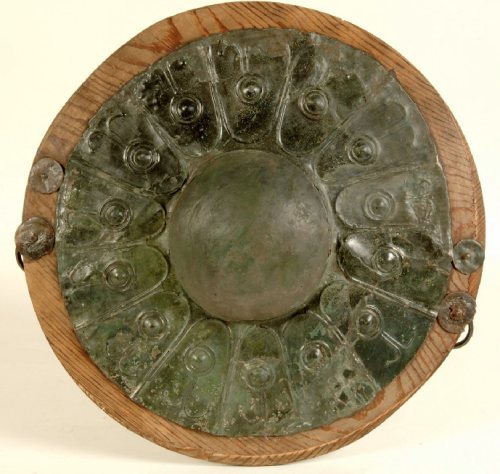 Representations of these shields appear with a central slot sometimes as a series of concentric circles. 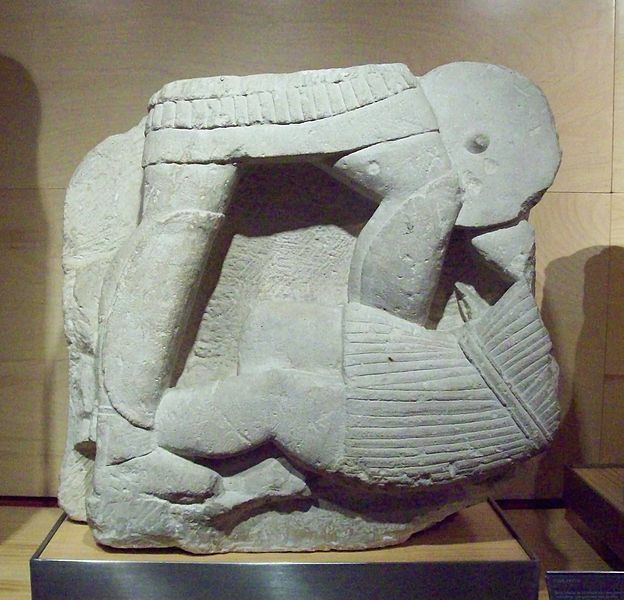 This feature appears in one of the oldest known Iberian monument showing humans, at Porcuna (Jaén), dating back from the mid 5th century BC. Some experts argues these were originally made of a serie of leather discs of different diameter, glued together, pressed against a mold to create the central embossing. Next to these leather shields other wooden shields were found, this time decorated on the outside with large embossed bronze studs, thin sheets giving no additional protection but extended to the edges of the shield, and were decorated, with some specific decorations that appeared throughout the Peninsula from the 5th century BC. These were deduced from the study of the handcuffs found at the warrior's funeral pye. The leather shields were quite light and probably used in training or parade, while and wooden ones were the most used from the IV century BC.